So. I’ve been trying to write a new artist’s statement. I am finding it very tricky. I hope this is because I am sort of between things right now and not because my brain has evaporated. I have been thinking about the idea of geometry and the tether of history/the past. These ideas are flowing out of a response by a math student to my piece women hold up half the sky. 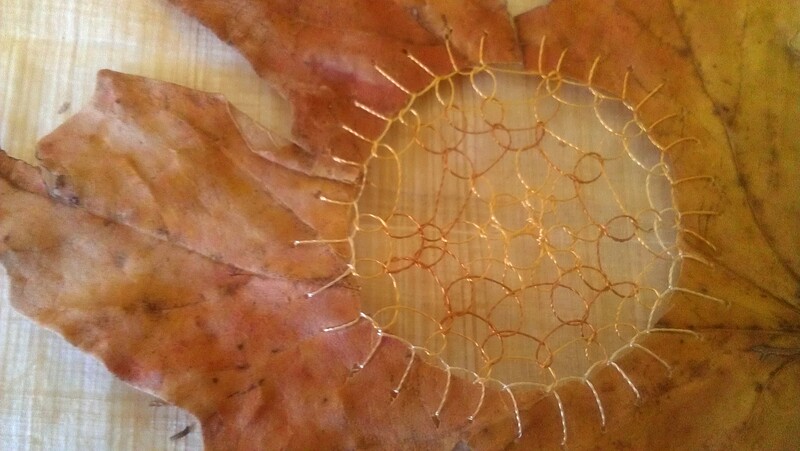 I’m also drawn to the metaphors of stitch as a way of giving flat materials a shape. It always comes back around to a needle and thread. I mention this about the writing because it seems relevant to my current studio project. 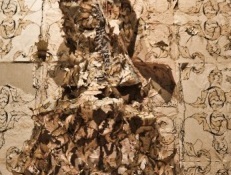 The kozo group is working on a new exhibition of sculptural paper. 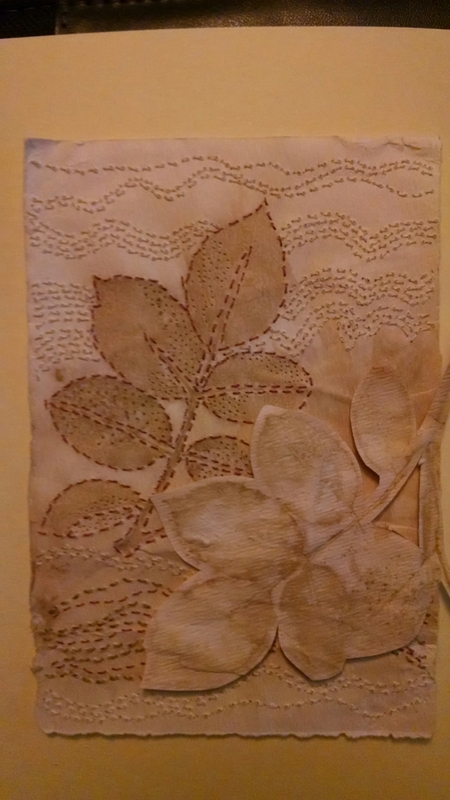 I decided to try shaping paper with only stitch. Taking flat sheets of kozo as a starting point I have been trying to coax some interesting form from them. Of course I started by sewing in circles. Here’s a sample of that exploration. This is easier to control, but is that a good thing? Pushing on. Stay tuned to see if I arrive anywhere at all. 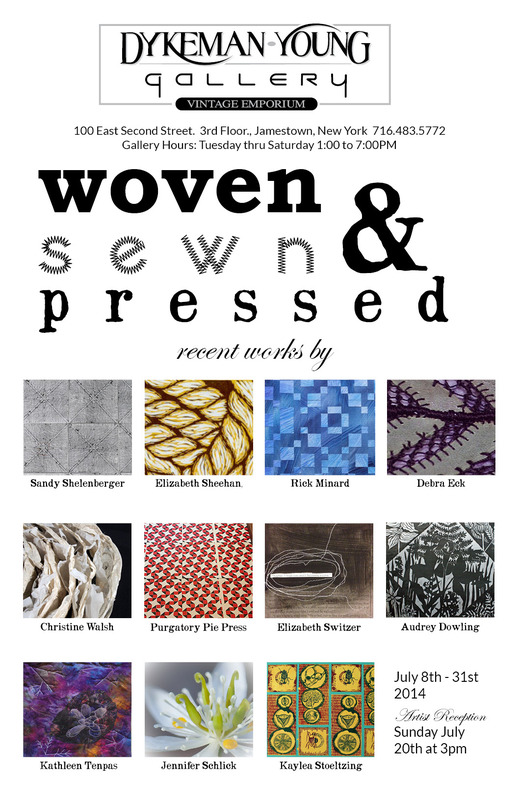 I have work in a new exhibit which opens this Friday (Working with paper, Center Gallery in Olean, NY, 6-8pm). Regular readers have been sharing my struggle to get this work completed, so I thought I would share this moment of resolution with you too. It would be wonderful to see some of you at the opening, but I will also try to post some better pictures once the show is finished and properly lighted. Thanks to everyone who encouraged me through the dark days and helped me reach this moment. 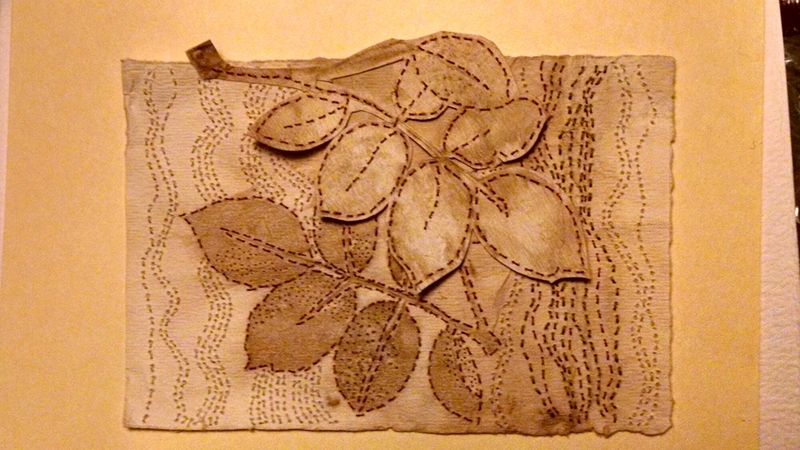 Sometime in the last couple of years I tried dyeing some paper using plant materials. I put them under weights, put them in the corner of the office, and forgot about them. 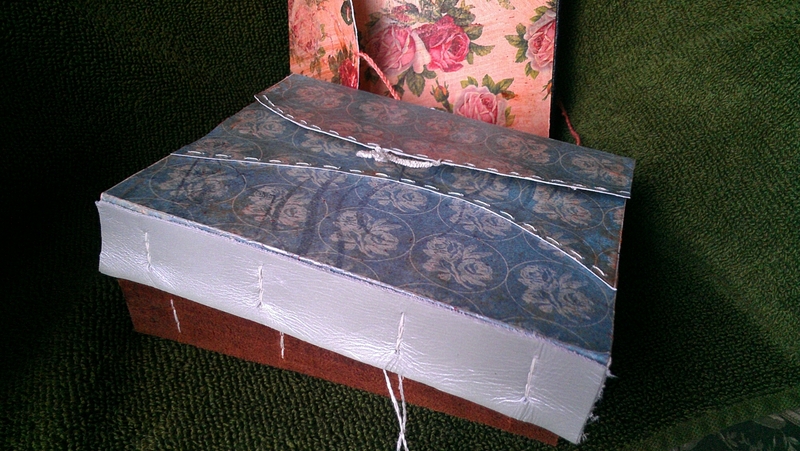 By the time I accidentally rediscovered them many of the pages were moldy but I could salvage a few. Then I put them in a basket of other papers and forgot about them again. Earlier this month I came across a call for work for a 4×6 exchange exhibit. You send a work and get a random work returned. So after rediscovering them for a second time, I pulled out one of those sheets of eco-dyed paper and tore it down to size. 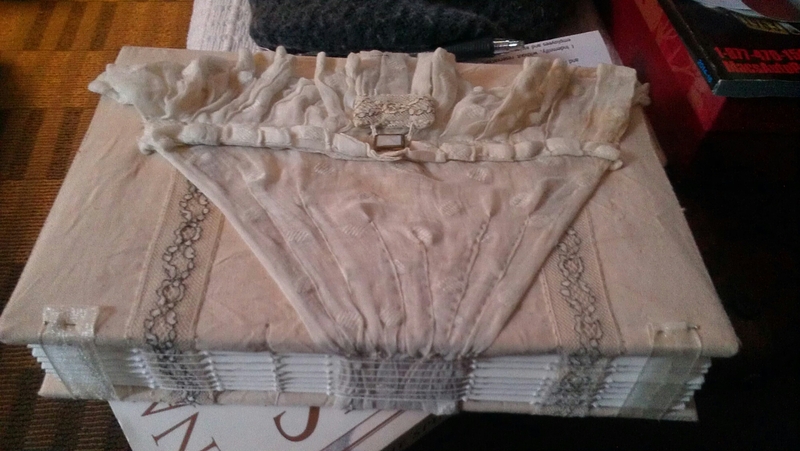 I started sewing. 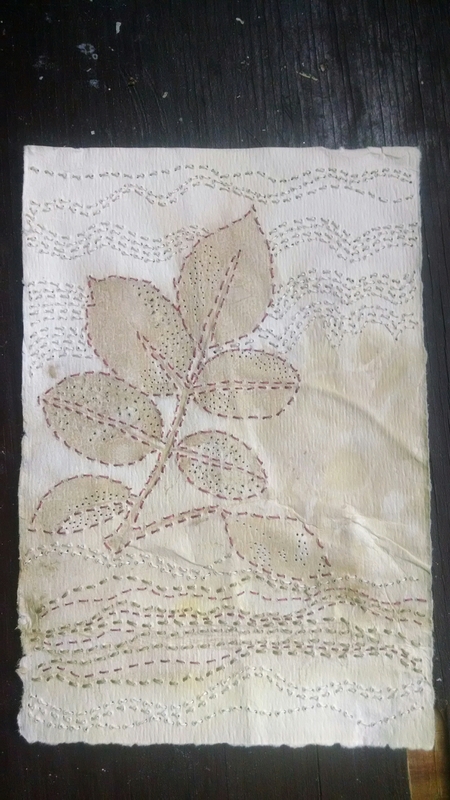 I thought this was okay, but not really wow, so inspired by the splotchy dye on the leaves I thought I would add some french knots. This was an awful decision. They were too much. 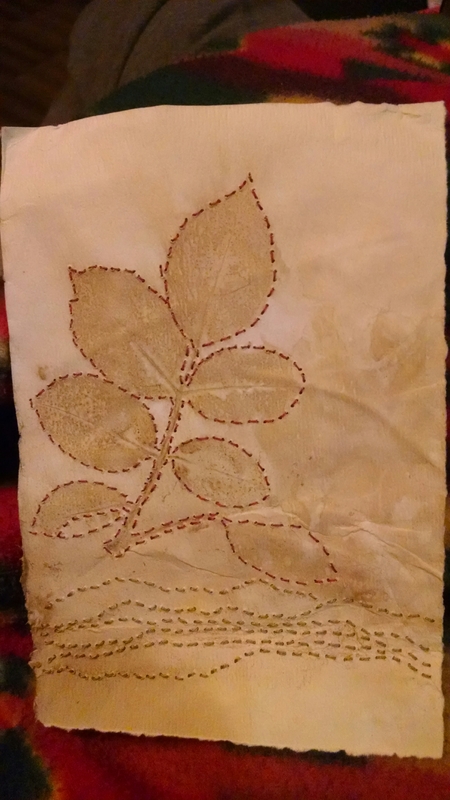 Having gone too far I decided there was nothing to do but keep going, so I added more stitching using a finer thread almost the color of the paper. 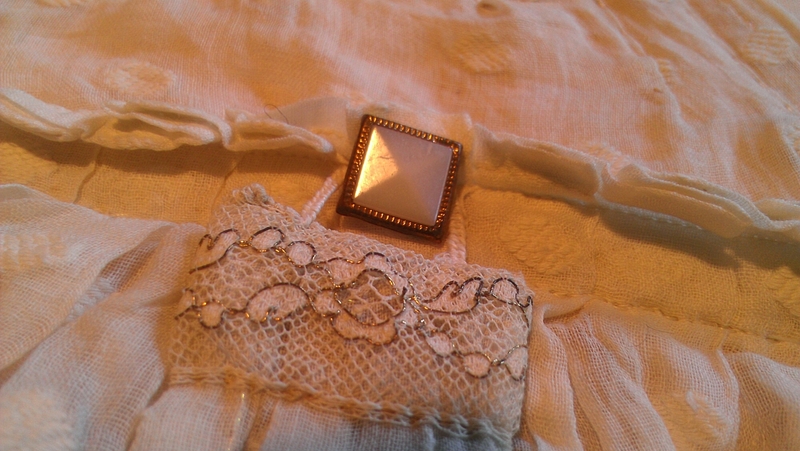 This was better, but I hated the french knots so a good friend and fellow artist Elena suggested I just take them out. Duh! Brilliant! And that was much better, but still unbalanced. I posted a picture on Facebook and several other art friends weighed in. Sometimes you need another set of eyes. Another artist, Anna, suggested adding more layers to the composition. Again, brilliant. This paper had a mirror twin from where the leaves were pressed in. So I cut out the main leaf to add on top. Already I was feeling happier. So I embroidered around the edges and trimmed a little more with a scalpel. 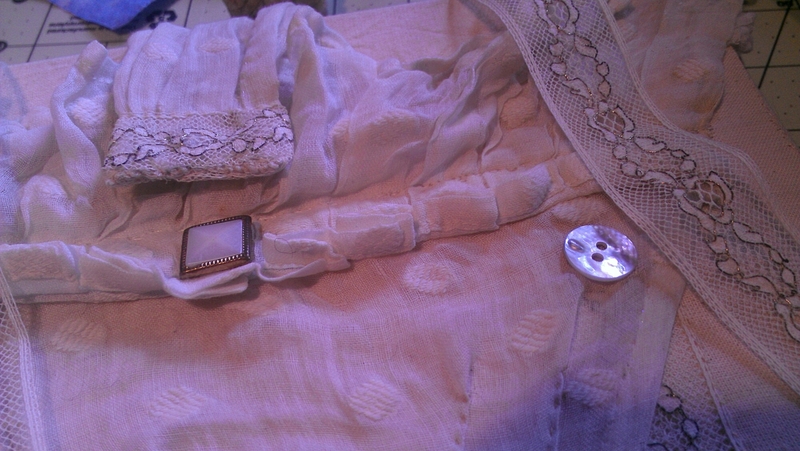 Then sewed through the layers. So here is the final composition. Better by committee. And off on its way to the exhibit. One of the most amazing things about the internet is that it brings other artists into my studio. Sometimes you need fresh eyes and its great to be able to reach out to people you admire and trust. 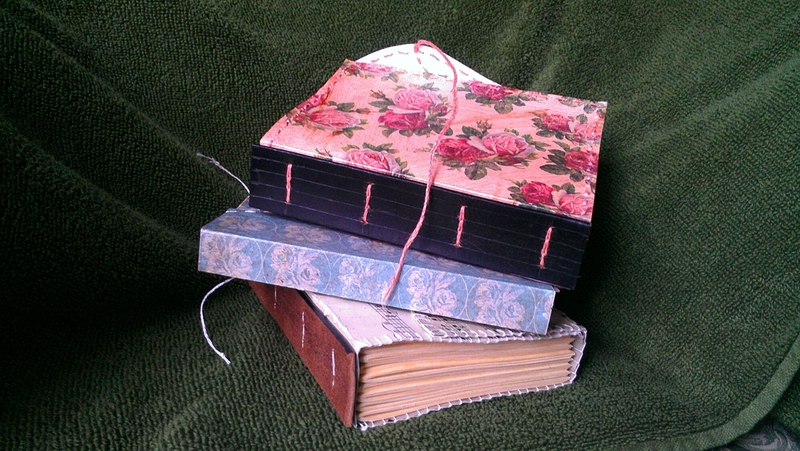 Recycled paper and leather journals in the studio yesterday. 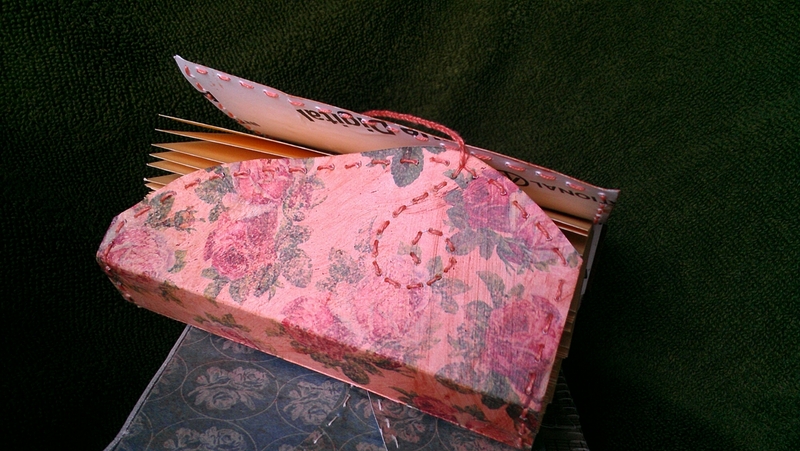 A friend recently donated some vintage fabrics to me, so I have been experimenting with some fabric covered books. 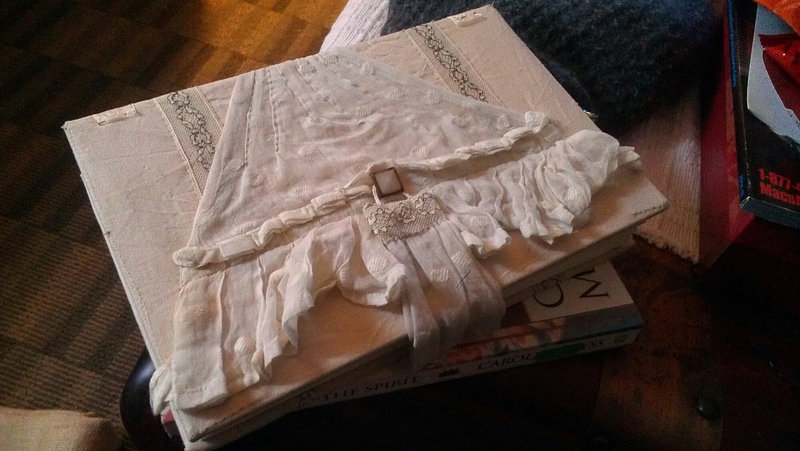 This one is almost finished, it features part of a bonnet or apron, along with some Victorian lace trim and a gorgeous button. 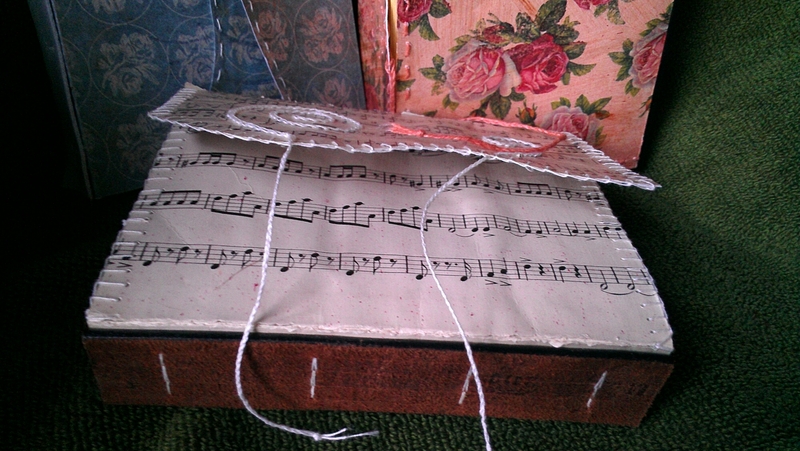 It was super time consuming, but in my favorite way, needle in hand. It feels good to be working in the studio after last weeks hectic pace. I am up to my ears in grading – and behind on everything because for some reason I thought it was a great idea to have a major international exhibition in the middle of the semester – well the show WAS an excellent idea – the timing not my most brilliant idea ever. Ah well, live and learn. I have SO much to share about the experience – but it is going to have to wait one more week. 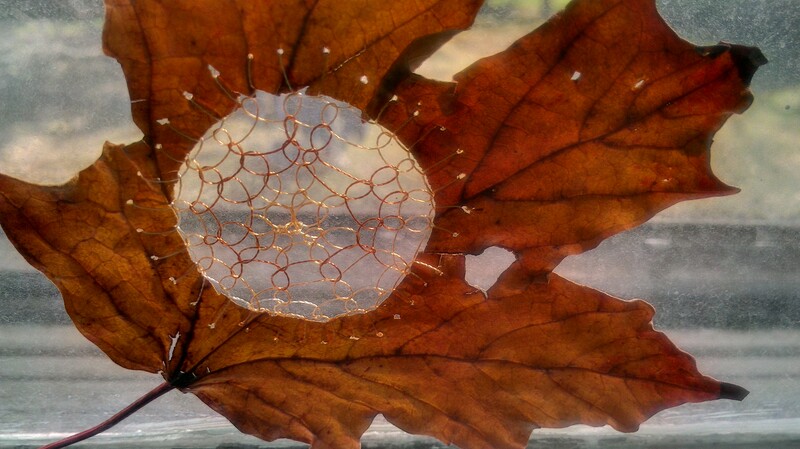 In the meantime more crazy leaf crush sewing! 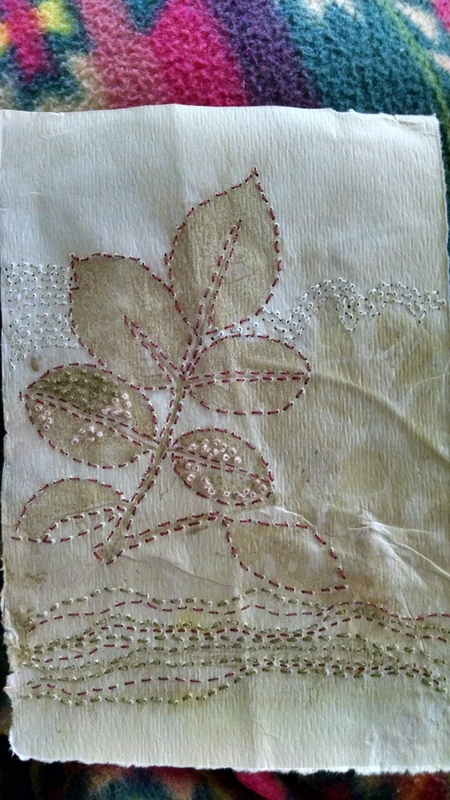 sewn with sulky thread and very tricky as the leaf was already pressed and dried – very fragile!